My son came down from Denver for Mothers Day weekend, so I had him help me take off the hard top. 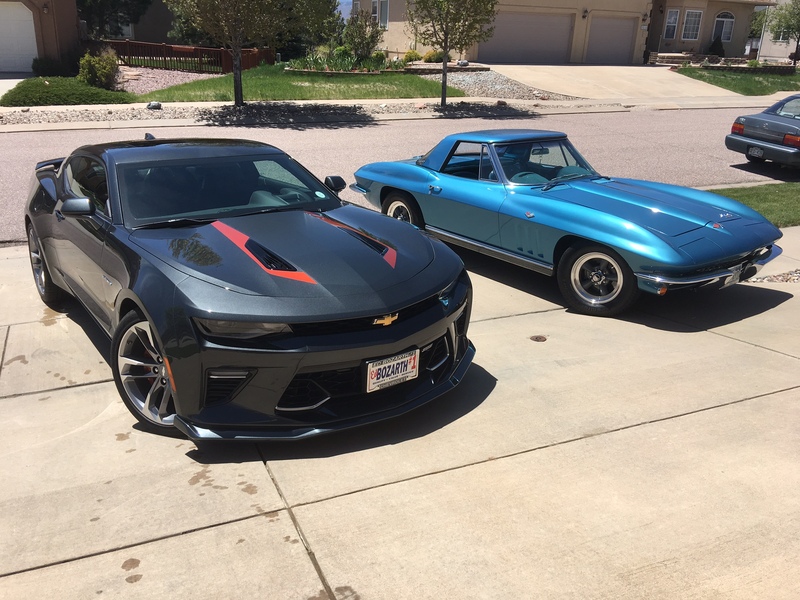 He just bought a 2017 50th anniversary Camaro, so we took a couple pictures of my '66 next to his new ride. May be the angle but that Camaro looks HUGH next to the Corvette?? i'll take the blue one. Its partly the angle, but the Camaro is definitely bigger than the Vette. It has the 455 hp engine and is extremely fast, but also handles very well. Here is another angle. It really is crazy how small the old Corvette's are. I have observed this on several occasions while they are parked near another, usually more modern car. 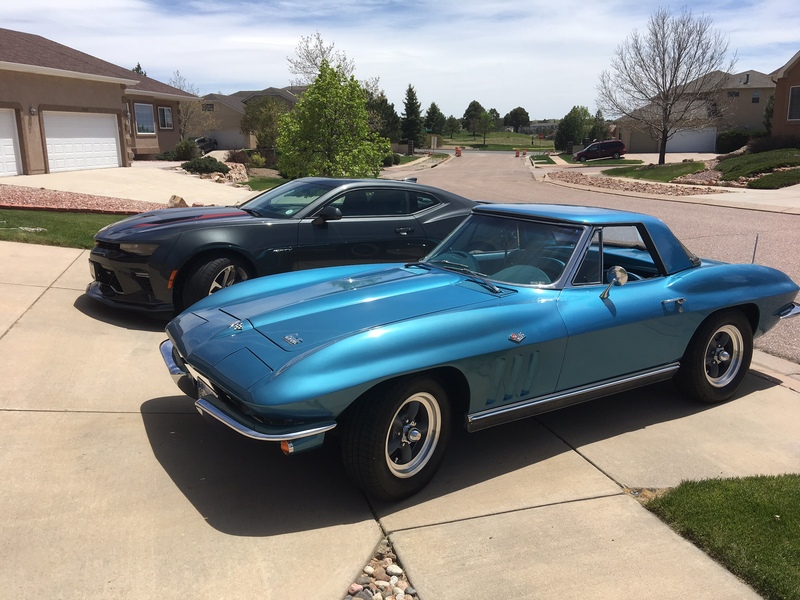 When I got my '67 in 1976, I took it to a shop several times where, whenever I picked it up, the owner would always tell one of his guys to "Bring that little Corvette up here." Since I had sold a Toyota Celica to buy it, I always thought it was huge. At 6'4" they get even smaller when you climb in one. Ha, try a C1 I am only 5'11" and I had to put the repo 15" steering wheel on to get in my 57 without contortions and with the hardtop on it is worse. back when they made these cars people were smaller. I was at a cruise night and a buddy of mine showed up with a old model T and I wanted to sit in it and I got in and I got stuck in it. people were much smaller back then. Check my avatar. I just sold our '57 Fuelie, and it was like driving an Escalade compared to wadding myself up to get in our '54. The '62 isn't as bad, but it's still tight. C2's are about like riding coach on a Southwest Airlines flight. John Wayne had a 1953 Corvette. He later gave it to a friend because he didn't fit in it. 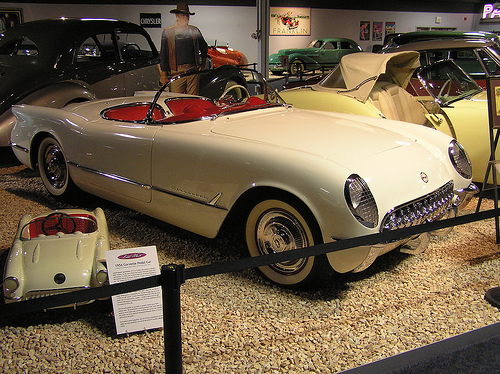 One of the most famous Corvette convertibles is John Wayne’s 1953 model, which is on display along with his likeness at a museum in Las Vegas. Sadly, John Wayne eventually had to give up his Corvette soft top, because he had too much difficulty getting in and out of the vehicle. 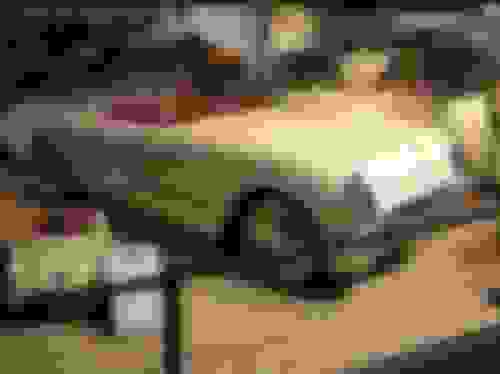 At 6’4″ and with a number of old injuries from a career of performing his own stunts, the beautiful Corvette convertible was no longer in the cards. Wayne gave the car to his friend and fellow actor, Ward Bond. That's 2 great looking Chevrolets you have there. They are light years apart in technology. The new Camaro has amazing performance but I have wonder does it really need to be that big. I can only image the performance if it was 500 pounds lighter. The auto industry is all about profit and don't build many specific "platforms" they will use what they currently build to make something else the public wants. When it all started with Chrysler talking about a retro Challenger the prototype show car was much smaller than what it ended up being---built on the Chrysler 300 platform along with many other cars like it in the line. My son's new 2017 Camaro is actually smaller and lighter than models just a few years earlier. I do agree it could perform better if smaller and lighter, but with the 455 hp V8, FE4 adaptive suspension and Brembo brakes, it handles very well and goes 0-60 in under 4 seconds. Not too shabby. interesting, as they are essentially the same chassis and suspension. The new Camaro actually lost a couple hundred pounds versus the new Mustang which picked up a couple hundred pounds. I actually prefer Mustangs but I have to give Chevrolet credit for moving in the right direction. Looks like pretty weather in Colo Springs now. My Dad and siblings all live in Monument and it seems like everytime I've talked to them up until a couple of weeks ago, they were getting snow.